Accompanied with the heat and humidity of summer are pesky, itchy and annoying mosquito bites. 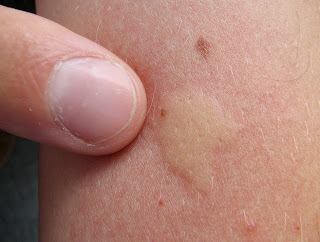 Mosquitoes bite because they are attracted to CO2 and lactic acid. If you are a living, breathing mammal, you are a walking target. I dread the mosquito months and have since I was a child growing up in Florida. I'm plagued by my body's reaction to these small bites that turn into large almost welt-like, itchy raised bumps on my legs and arms. There have been seasons where running out to get the paper in the morning or taking out the trash has inflicted a handful of bites. Modern technology has created great inventions like the mosquito magnet and the bug zapper but most communities or individuals in the south have not invested in these bug repellents. Apart from putting on topical insect repellent products laced with unhealthy chemicals like DEET that can cause brain toxicity; there are a few alternative options that have yielded positive results in my battle to protect my extremities from mosquito bites. Over the years, I have asked myself: what products repel insect bites like mosquitoes? I've invested in products like skin-so-soft and OFF mosquito sprays but have always wanted to find a more natural alternative and solution to these bug bites. Diet can play a very pivitol role in making oneself less attractive to the mosquitoes. Diets high in garlic (and garlic tablets) and B complex can actually change the extremely faint scent of an individual; thus making oneself less attractive to a hungry mosquito. Garlic literally does repel the vampires. Other herbs that are also important in repelling mosquitoes are: citronella, cedar, verbena, geranium, lavender, pine, cinnamon, rosemary, basil, thyme, allspice, and peppermint. Vitamin B1 has a unique ability to create an obnoxious scent that stops mosquitoes in their tracks. Ingested orally each day, an individual can take 15mgs of B1 for every 30 pounds of body weight. It is indeed possible to combat mosquitoes naturally and still enjoy the summer months. Melissa Gallagher is the founder and president of Healthy Being, LLC. She is currently completing her Doctorate of Naturopathy and CNHP (Certification for Natural Health Practitioner) and fell upon natural health and healing as a means to combat a severe case of mono she had over 4 years ago. Being launched Healthy Being in a Box: a product line that produces specific kits that contain a variety of specific vitamins and supplements, homeopathic products and herbal remedies that target various ailments and health concerns.